Ring Communications have supplied many systems to industrial, Medical & Military customers. basic Public Address Systems can be as small as one speaker, amplifier and a microphone. The next stage up is a system linked with an intercom system. The intercom system provides communications between the reception and the doctors. From this system the receptionist or doctors can make an announcement over speakers mounted in the waiting room. Back ground music can be played via CD player. The larger system can include many speakers split into floors, corridors, departments. Depending on what is required the system can be designed to include back ground music, pre-recorded announcements, and evacuation instructions. Both the Pulse & Alphacom can provide public address interface and control. The larger system the Alphacom can provide public address over a single building, university campus or even a city. 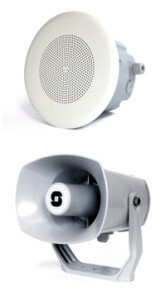 We supply a range of speakers supplied from Zenitel and DNH, Analoque and IP.